You can set up vendors for tracking repair orders with services supplied by vendors to your company’s clients. You can add a repair location for each of your vendors or add one repair location for multiple vendors. 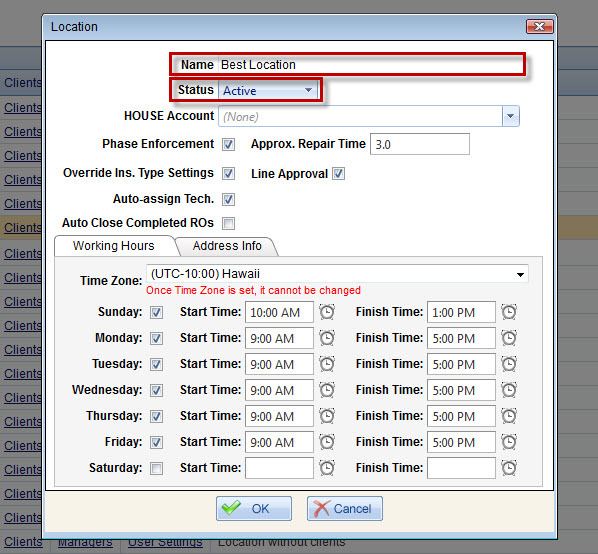 In the Location dialog box, type the name of the vendor repair location in the Name box, click Active in the Status box, if needed, enter other settings, and then click OK.
You can add as many vendor teams as many vendors supply services to your company clients, and the price for the same services may vary for a particular vendor team in a particular repair location. 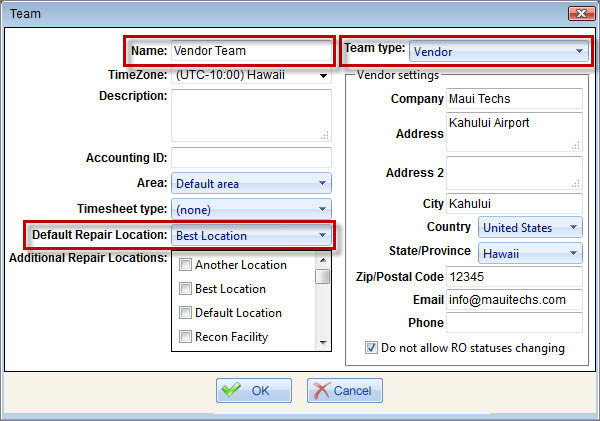 In the Team dialog box, type the name of the vendor team in the Name box, click the appropriate location in the Default Repair Location box, click Vendor in the Team Type box, if needed, enter other settings, and then click OK. Tip If you don’t want technician users (vendor employees who have access to the Back Office application) to change repair order status, select the Do not allow RO statuses changing check box. 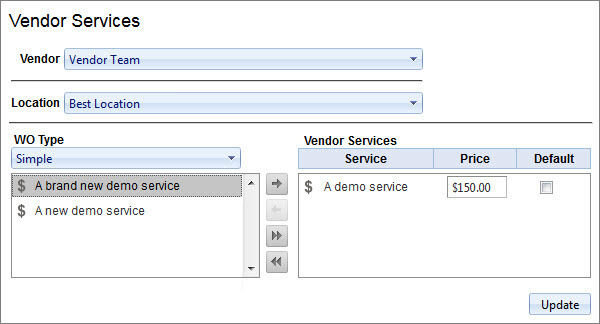 On the Teams page, in the Services column, click the Services link next to the appropriate vendor team. On the Vendor Services page, click the appropriate vendor team on the Vendor box, click the appropriate repair location in the Location box, and click the appropriate work order type in the WO Type box. Click the appropriate services in the box on the left, and then click the button with the right-pointing arrow to move selected services to the box on the right, enter the price of services in the Price column, and then click Update. Tip You can select the check box in the Default column next to a vendor service, if you want this service to be assigned to the given vendor team by default (even if this service is added to work orders by employees from other vendor teams). Note that you can change the default team in repair order services, if these services are assigned to other vendors as well. You can add vendor employees the same way you add your company employees, but you must assign vendor employees to vendor teams. On the Company tab, click Employees, and then on the Employees page, click Add on the toolbar. In the Employee dialog box, click the appropriate vendor team in the Team box, type the first name, last name, and password, select the appropriate role in the Roles section, if needed, enter other settings, and then click OK. 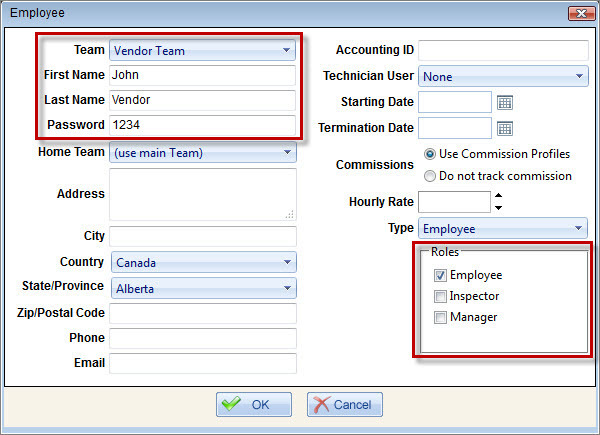 Tip You can also allow vendor employees to access the Back Office application data related to their scope. On the Company tab, click Users, and then on the Users page click Add on the toolbar. In the User dialog box, select the Technician check box in the Roles section, enter the appropriate settings, and click OK. 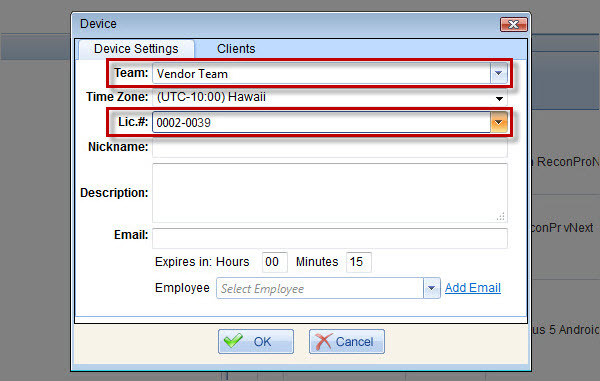 While creating or editing a vendor employee, in the Employee dialog box, click the appropriate user in the Technician User box, and click OK. The process of adding vendor devices includes getting registration codes in the Back Office application and entering them on devices. In the Device dialog box, on the Device Settings tab, click the appropriate vendor team in the Team box, click an available license in the Lic.# box, if needed, enter other settings, and then click OK. Important! By default the registration code will expire in 15 minutes after you click OK, so if you are not sure that the code can be entered on vendor device within 15 minutes, you can change the expiration period in the Expires In setting. Tip If it is the vendor employee who should enter the code on device, specify the vendor employee’s email address in the Email box, and the registration code will be sent to the vendor employee by email. If you register vendor device yourself, you can see the registration code in the Reg. Code column in the Pending Registrations section. 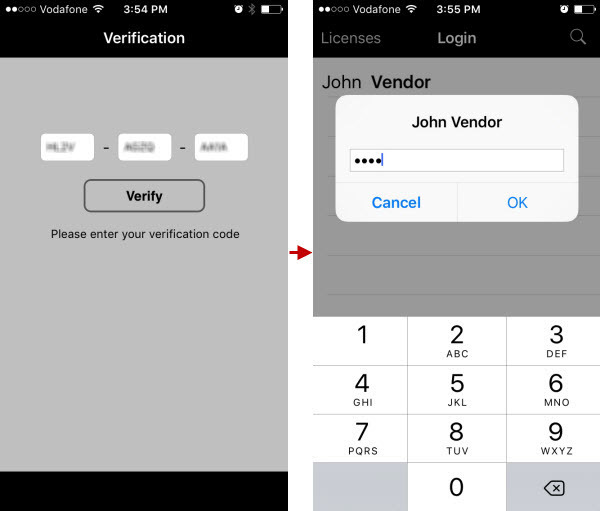 Open ReconPro on vendor device; on the Verification screen, type the registration code, tap Verify, and then on the Login screen, tap the appropriate vendor employee, type employee’s password, and tap OK.